^ a b Wadhams, Peter (1 January 2003). 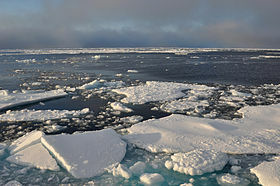 "How Does Arctic Sea Ice Form and Decay?". Arctic theme page. NOAA. Archived from the original on 6 March 2005. Retrieved 25 April 2005. ^ Greene, Chad A.; Young, Duncan A.; Gwyther, David E.; Galton-Fenzi, Benjamin K.; Blankenship, Donald D. (6 September 2018). "Seasonal dynamics of Totten Ice Shelf controlled by sea ice buttressing". The Cryosphere. 12 (9): 2869–2882. Bibcode:2018TCry...12.2869G. doi:10.5194/tc-12-2869-2018. ISSN 1994-0416. ^ Perovich, Donald (2017). "Chapter 4: Sea Ice and Sunlight". In Thomas, David (ed.). Sea Ice (3 ed.). Wiley-Blackwell. ^ "Sea Ice Ecology". Sea Ice Physics and Ecosystem eXperiment (SIPEX). Antarctic Climate & Ecosystems CRC. Archived from the original on 20 March 2012. Retrieved 23 June 2012. "Ice Glossary". Environment Canada. 27 September 2010.